Does your work include: retail, retail-service, wholesale, manufacturing, or royalties. Or a combination? Then this post is for you! If your business is NON-retail SERVICE only, click here to see a different walkthrough. ﻿Hello + Note from January 2019: The state has a new portal, which looks a little different. There’s GOOD and BAD news. Good: Once you’ve got your profile set up, and know what to do ……..this only takes a few minutes. BAD: It’s kinda tricky getting set up and navigating to the right place. Cost/B&O Taxes Due: If you earned under about $45K (gross sales), then you will not pay any B&O taxes to the state. If your gross sales were over $45K, then it could be a few hundred dollars up to a thousand or more. Options: Paper on Online. Recommended ~ use the ONLINE form! 2. Choose/Confirm the Tax Classifications that apply to you: Retail, Service, Wholesale, Manufacturing, Royalties, etc. If you're ready, click here to get started at the DOR.WA.gov. More info and screenshots below. If you have any trouble, call the DOR at 1.800.647.7706. It's their job to help you file your taxes! 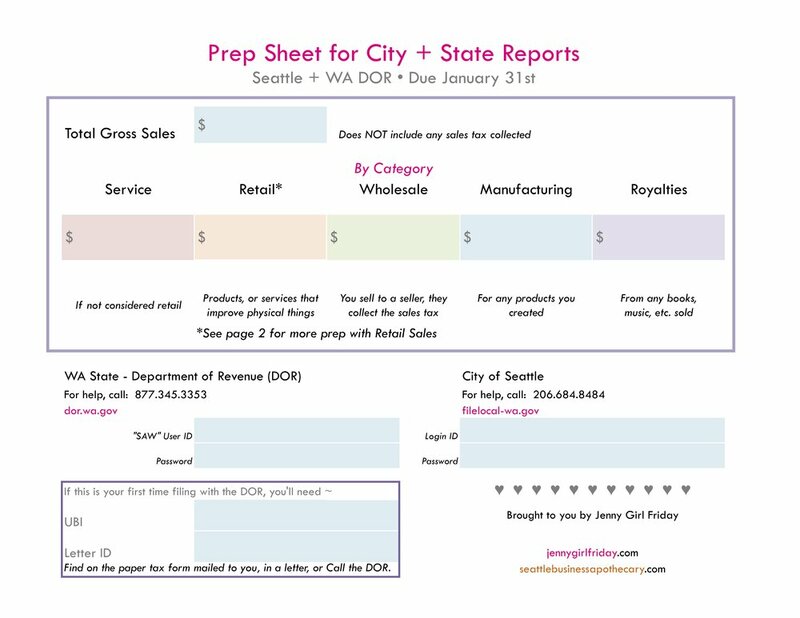 Reporting to WA is very similar to reporting to Seattle, but just a little more complicated. I recommend preparing for both at once. Everyone's situation is a little different, so it's hard to give estimates or exact instructions. 5. On your scheduled day, call the state to help you. Be prepared to wait...have something fun to do while on hold. Click on the image below, to get to a PDF to download. If you do not have an account yet with the DOR (Department of Revenue), you'll need to set one up. A blog post is coming soon to show this. Meanwhile, here's what I can tell you. Washington state collects three kinds of tax. The Department of Revenue (DOR) handles this. B & O Tax - Business and Occupation. Every business has to pay this tax, though small businesses get a credit, so you might not owe any! Different industries are taxed on business activities. The percentages vary. Use Tax - This might apply to you. (Though I don't cover it in the screenshots below.) It's like sales tax for things you buy in other states. 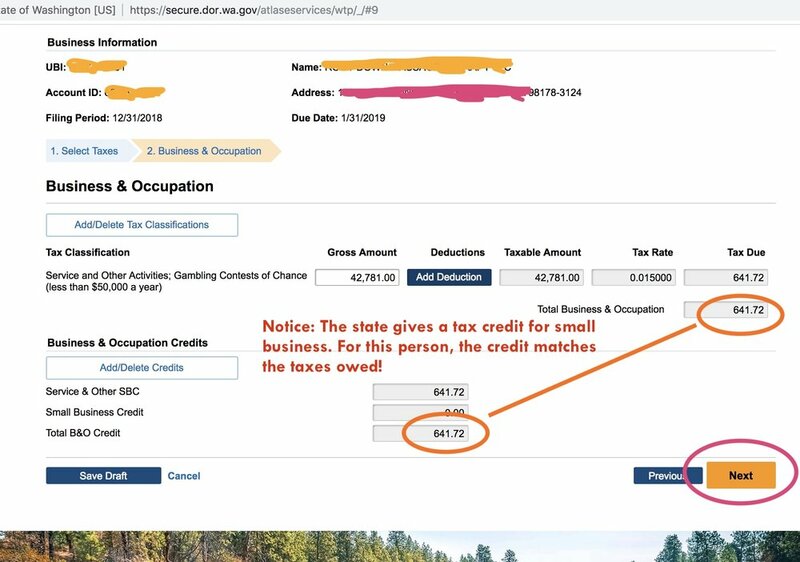 For example, if you buy a computer in Portland, you'd be required to pay Use Tax in WA state for it. Sales Tax - This is a tax that businesses collect and submit, versus a tax one pays. If you're a (NON-Retail) Service provider, you don't have to collect this tax! Click here to read about Services vs. Retail Service. The DOR collects for both the state and the city/cities (referred to as local tax). To get started, click here to go to the DOR.WA.gov. At some point in the past, you may have gotten a SAW User ID. If you can find this, use it. And/or use the ‘Forgot’ links to get this info. IF this all looks super new to you……..then Sign Up as a new user. The link is to the right of the circle. If you have the letter, follow the screens and fill in your information to link your Business account. Once you’re in…………….select your business and confirm. On this screen ……….we’re setting up which “Tax Classifications” (business categories) apply to us. Probably ~ There are some listed for you already. Review them to see if they match your business. 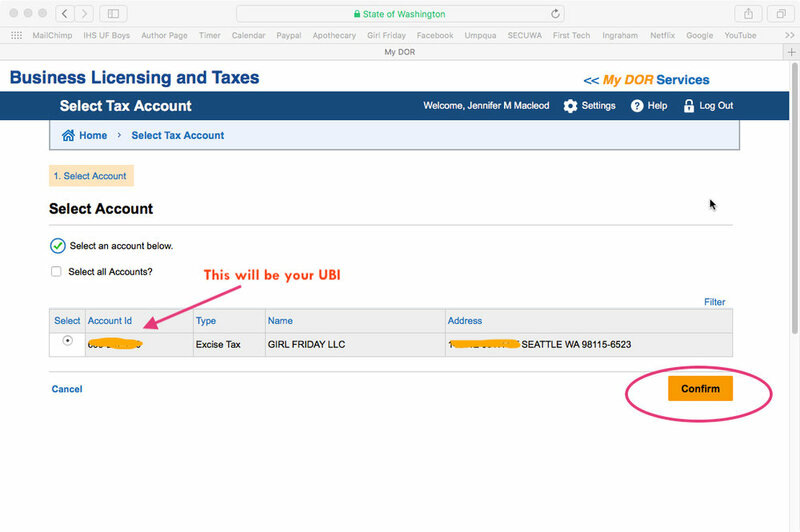 Click the “Add/Delete Tax Classifications” button. It will bring up a very large menu of classifications. Find all that apply to you. If you do any Non-Retail Service, then look for one that says, “SERVICE and Other Activities; Gambling Contests of Chance (less than $50,000 a year). Select the bullet next to each relevant classification (category). Then, scroll down and hit NEXT. It should put you back on this screen. Once your Tax Classifications are correct, hit NEXT. 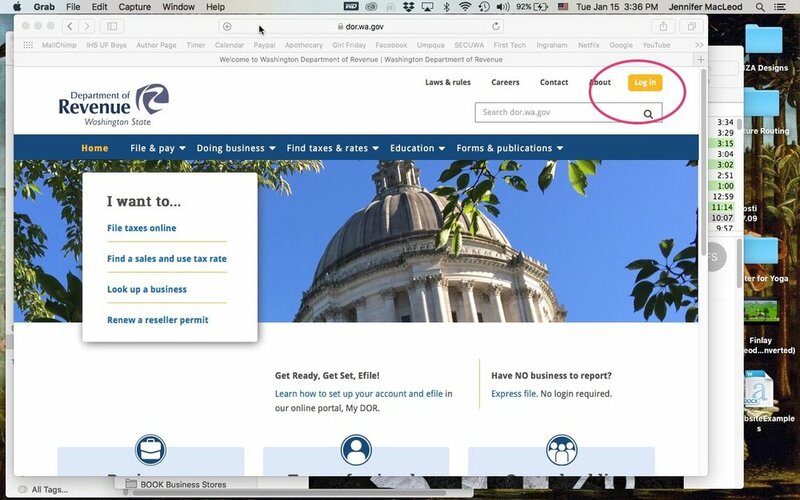 Now we’re on the Business & Occupation (B&O) Tax page. > > > NOTE! 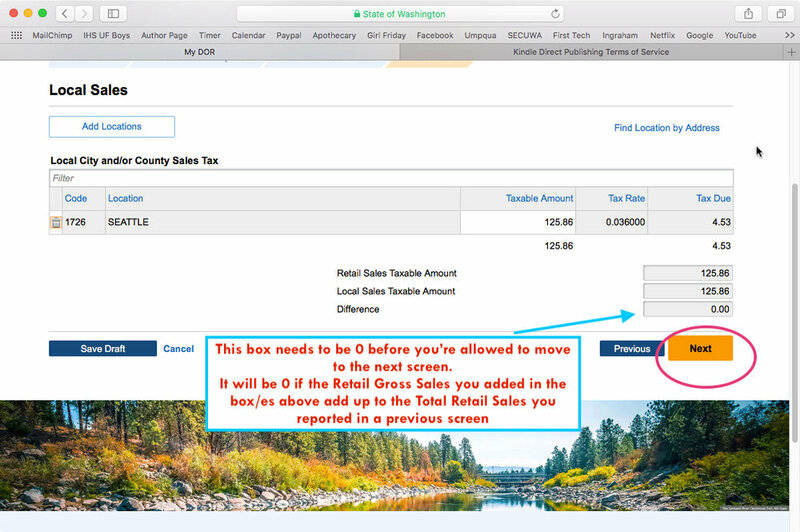 If you had sales OUTSIDE of WA state, you will not owe Sales Tax for those transactions. Because this system is so new, I haven’t figured out to Deduct the Out-of-state gross sales yet. I suspect it’s on this screen …..by clicking the Add Deduction button. Try that. If you don’t find it there, call the state’s HELP with electronic filing number: 1-877-345-3353. The Gross Amount is probably filled in. If not, add it in this box and hit TAB. You’ll need to add the Gross Retail Sales for each city. If you had Retail sales in cities not showing on the list, click the “Add Locations” button and follow the prompts. There’s a 2nd screenshot with more notes about this page. Taxes owed by category, along with credits. Look it over to see if everything looks right. 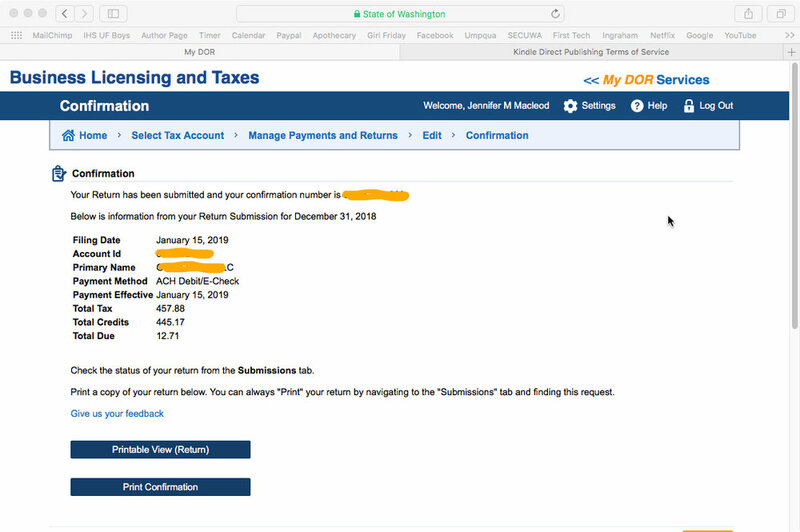 If you owe $0, then you’ll be sent to a Confirmation Screen (example at the bottom). Final review time………with the Tax Amount that you need to submit. It’s a good idea to save a pdf on your computer / or print for your records. Well done! This will be way easier next year, now that you've been through it. Please take a little moment to reward yourself. Perhaps some nice chocolate, a walk outside, a glass of wine, or order dinner in tonight. By any chance, did the state assign you to make Quarterly reports? Versus Annual reports? This sometimes happens when self-employed folks register an LLC. If you want to change from Quarterly to Annually, you must call the DOR (Department of Revenue) during the month of January. And only in January! The number is 1.800.647.7706. 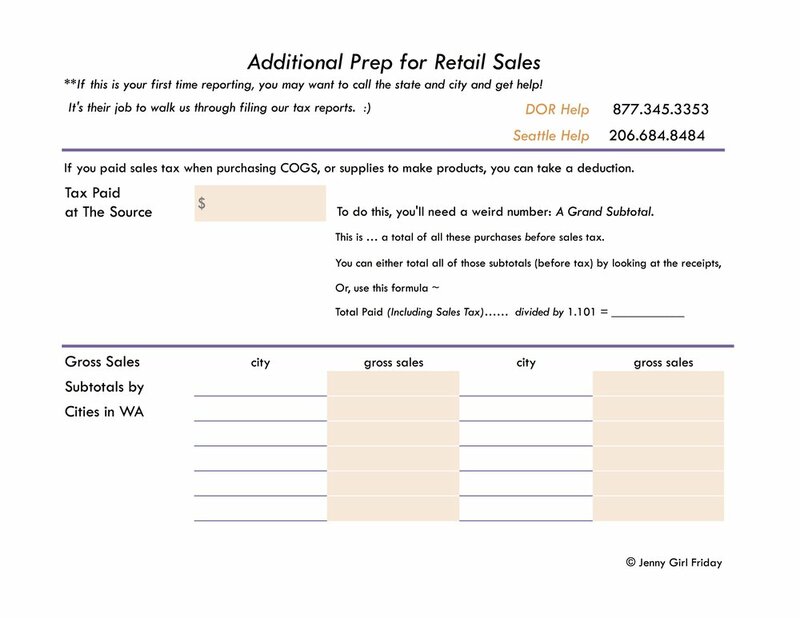 If your annual Gross Sales are under a certain amount, they will make the change for you. P.S.2 Did this help? I hope so! Pretty please share with any friends, or post on Facebook. I think self-employed folks are keeping the soul in Seattle. I want to make the chores of business easier, so you can all keep being awesome and shining your light. If you are a retail business, or a combination of service + retail, click here to read a different walkthrough. To learn more about Service vs. Retail Services, click here. Hello + Note from January 2019: The state has a new portal, which looks a little different than before. Once there though, it’s easy! All you have to do is enter your Gross Sales in one box. 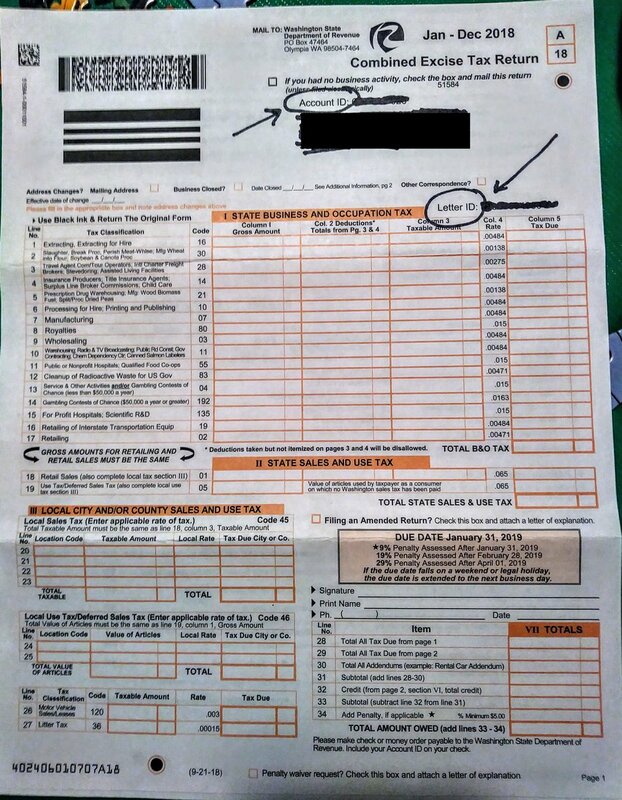 If it’s your first year of business: it will be on a tax form they sent~ with orange boxes. See below. 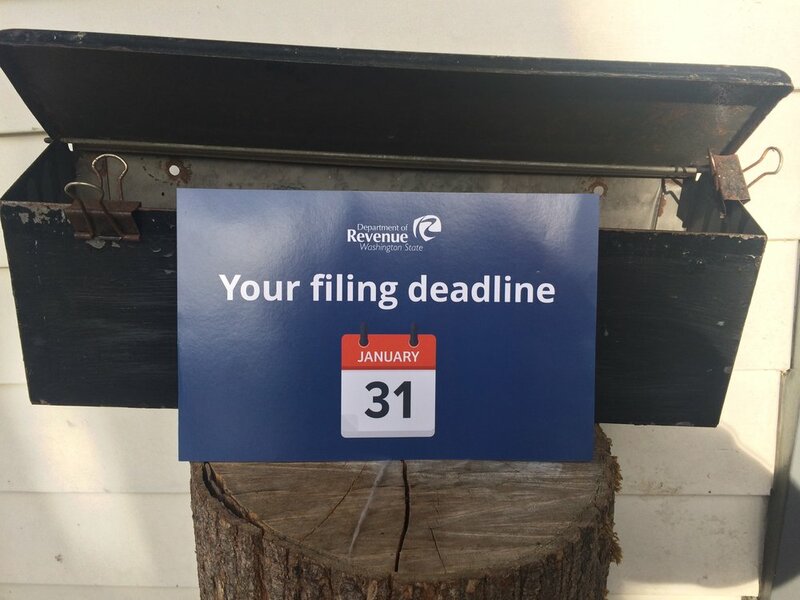 If you’ve filed online, it will be in a letter. See below. 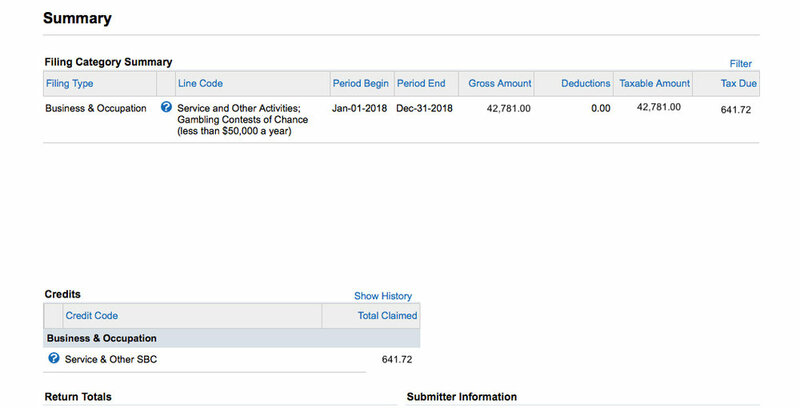 Cost/Taxes Due: $0 if you earned under about $45K. Over $45K, it can be a few hundred dollars to a thousand or more. OR, read on for more information and screenshots. Washington state collects three kinds of tax. The Department of Revenue handles this. Sales Tax - This is a tax that business collect and submit, versus a tax one pays. If you're a (NON-Retail) Service provider, you don't have to collect this tax! Click here to read about Services vs. Retail Service. If you do not have an ONLINE account yet with the DOR (Department of Revenue), you'll need to set one up. A blog post is coming soon to show this. Meanwhile, here's what I can tell you. Click Log In to get started. If you need to set up a user account, you can do so on the next page. At some point in the past, you may have gotten a SAW User ID. If you can find this, use it. And/or use the ‘Forgot’ links to get this log in. At this point, you’ll have to wait for the letter to complete this process. (It’s possible if you call the state, that they could give you the codes over the phone. For SERVICE providers, you only need one. It’s shown here. In theory, it should already be on your profile. IF NOT: click the “Add/Delete Tax Classifications” button. It will bring up a very large menu of classifications. Find the one that says, “SERVICE and Other Activities; Gambling Contests of Chance (less than $50,000 a year). Select the bullet next to it. scroll down and hit NEXT. It should put you back on this screen. Enter your Gross Sales in the spot shown below. Then, hit TAB………..look at the following Screenshot to see what happens next. This is an example of what your SUMMARY screen might look like. This image had other tax categories on it that I covered up, so yours will maybe look a little different. Fill out your Info, then hit NEXT. IF you do NOT owe any money, you’ll be sent to the Confirmation Screen (a few images below). 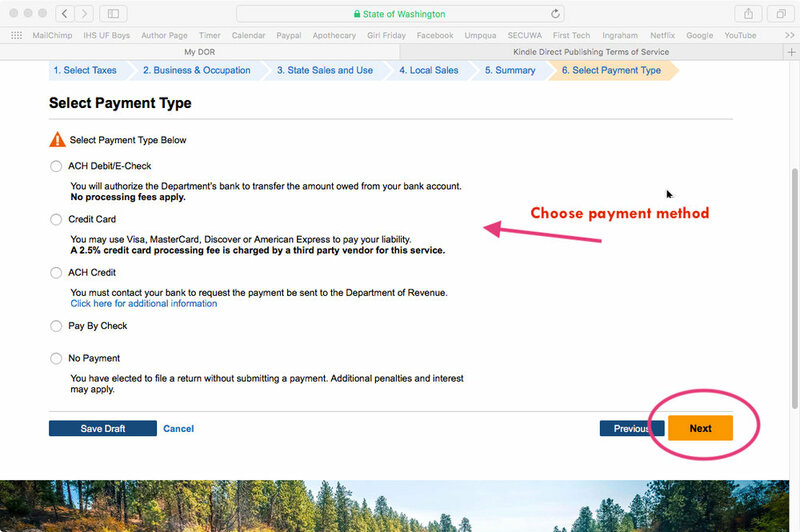 IF you do OWE money, it’ll send you to this payment option screen. This image shows some fields that might not be on your screen. It’s just to show what it might look like if you owe some money. P.S. Did this help? I hope so! Pretty please share with any friends, or post on Facebook. I think self-employed folks are keeping the soul in Seattle. I want to make the chores of business easier, so you can all keep being awesome and shining your light.